FSG Press Conference Statement, Tuesday, 11 November, 2015, at the International Press Centre, Accra. 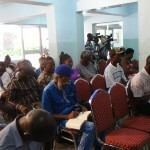 Food Sovereignty Ghana (FSG) strongly disagrees. It is our contention that such a conclusion could only be arrived at after the examination of the substantive issues; that the very use of the word “biosafety” implies a certain consensus among the scientific community on the need for a strict adherence to good biosafety practices, indispensable in any national development model. It is the contention of FSG that Modern Biotechnology is a potent and novel technology that presents unique risks. This means that whatever the perceived benefits seen in advances in biotechnology, they must be developed and used with adequate safety measures for the environment and human health. This is why the international conventions such as the Cartagena Protocol on Biosafety (CPB), and the Convention on Biological Diversity (CBD) regulating its safe use need to be respected, hence our application for the injunction. 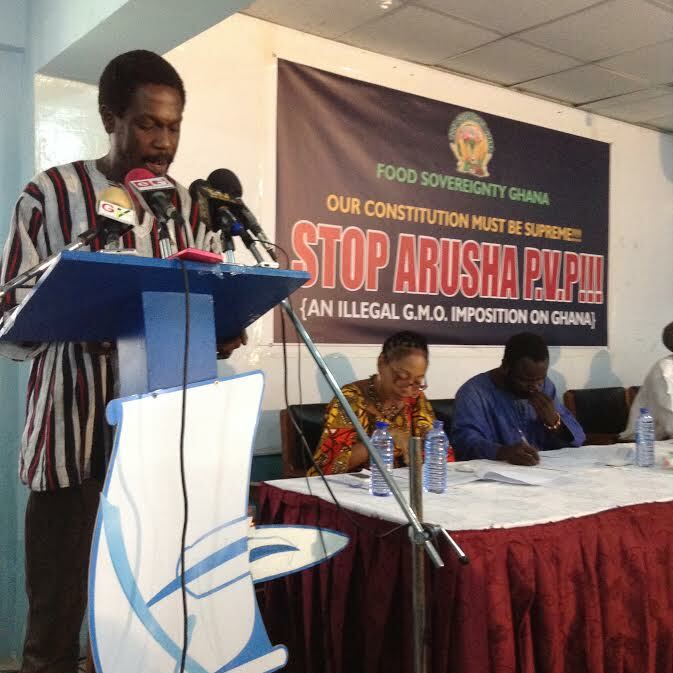 We wish to respectfully express our astonishment as to the fact that the defendants’ main ground of opposition to the application for injunction was that they do not intend to release BT Cowpea and GM Rice, which the court never touched on. We respectfully beg to ask, if the Defendants themselves are claiming, that they have no intention of commercial release of these crops, being BT Cowpea and GM Rice, , then where is the “irreparable damage and hardship” that they are expected to suffer be coming from? Our case for the Interlocutory Injunction is simple. We have noticed certain irregularities and illegalities in the approval for the “confined field trials” and therefore plead that they must not, and cannot, be used as a basis for the granting of approval for the commercial release of same. The “confined field trials” for the Bt cowpeas and the genetically modified rice did little to respect the provisions of Advance Informed Agreement under the Protocols; that advance informed consent includes public awareness and participation in the decision-making processes leading to the intentional release of living modified organisms into the environment. “The law is that, GMOs should be differentiated from organic or natural cause, and should be labelled to enable consumers know the products to take an informed decision”. Ladies and gentlemen of the press, FSG strongly disagrees with the Judge on the issue of labelling because Ghana currently does not have a law calling for the labelling of GMOs. The other fact that we intend to contest is the interpretation of the applicability of the CPB and the CBD. Even assuming that the use and handling of internally generated GMOs have nothing to do with transboundary movements, how can a GMO that has been imported from Australia, not be a transboundary issue? Is that not what we normally call import and export? Is this an internal matter? We are thus of the firm conviction that the court’s view on transboundary issues is respectfully erroneous because provisions in the Cartagena Protocol were heavily in favour of FSG’s application and these provisions are provided for by the Ghanaian laws on biosafety, ie Act 831, L.I 1887. The approval for the confined field trials was consequently illegal, and should not form a basis for an application for a commercial release. It is a fact that the Bt cowpea was imported to Ghana from Australia. Here in Ghana, it was subjected to experiments in greenhouses and then the fields. This does not remove it from the fact that it was imported from Australia. So definitely transboundary movements of the GM cowpea did occur, which will trigger the provisions of the Protocol. The provisions of Articles, 7-10, Article, 15, in the CPB must be complied with and read together with the annexures. Field trials are intentional introductions into the environment. When the defendants imported the GM cowpea from Australia, they did so with the intention of conducting field trials which they did. Whilst Article 6 exempts “contained use”, this exemption does not extend to “confined field trials”. Article 38 makes no room for reservations, and Article 24 demands that transboundary movements of living modified organisms between Parties and non-Parties shall be consistent with the objective of the Protocol. GMOs in agriculture are products of ‘Modern Biotechnology’ created when the genomes of organisms are transformed through laboratory techniques, including genetically engineered DNA (recombinant) and their direct introduction into cells. The CPD makes it clear that these are not techniques used in traditional breeding and selection. This laboratory-based technology requires ‘sceptical’ (doubt, don’t presume safety) analyses in rigorous risk assessment protocols including hazard identification to detect hazards and the potential to cause unintended effects. The CBD therefore, deliberated intensively and extensively about what is required to regulate the safe release of GMOs into the environment (for impacts on health, the environment and SEC (socio-economic considerations)), and keeping in mind the PP (precautionary principle)”. There is a sharply divided opinion in the scientific community, even among molecular biologists, that genetically engineered crops are “safe”. The recent email scandals showing the big influence of the biotechnology industry on the scientific community adds yet another twist of where the scientific consensus would swing to without the corrupting influence of the industry. Hence the only avenue available to them to legally approve any genetically engineered crop must be to follow the Advance Informed Agreement (AIA) Procedure under the Protocol. There is no other way around it and this has not been respected. The only evidence submitted by the Defendants as to the safety of GMOs was “a fact Sheet developed by the World Health Organisation, (WHO), for its member states (including Ghana) to provide a balanced information on GMOs”. This fact Sheet developed by the World Health Organisation, (WHO), on GMOs, has Section 8, “Are GMOs Safe?” which strongly recommends “continuous assessments based on Codex Alimentarius”. Ladies and gentlemen of the press, this recommendation by the WHO is hardly followed by regulators. For example, the Codex Alimentarius guidance draws special attention to the characterisation of novel RNAs, stating: “Information should be provided on any expressed substances in the recombinant-DNA plant; this should include: A) the gene product(s) (e.g. a protein or an untranslated RNA)” paragraph 32 of (Dhurua, S and Gujar, G. T (2011): Field-evolved resistance to Bt toxin Cry1Ac in the pink Bollworm, Pectinophora gossypiella (Saunders) (Lepidoptera: Gelechiidae), from India. Pest Management Science. Volume 67, Issue 8, pages 898–903, August 2011). One important point to keep in mind and that is rarely spoken is that there is no science that demonstrates GMOs are safe to eat. There is only industry designed testing designed to demonstrate what industry wants us to think. GMOs were approved in the US on the basis of substantial equivalence as claimed by Monsanto here, without any independent testing. That is the model USAID is pushing. In a situation where the “promoters” of GM technology, also double as the “regulators”, the vigilance of a vibrant civil society is crucial in ensuring its own safety. This is what we are respectfully asking from the courts. Thank you very much for your kind attention. We may now take questions.